FAME's Articles of Incorporation, Bylaws, and Policies & Procedures can be found on the Committee on Governing Documents page. True to its beginning, FAME continues to address change and include the ever expanding role of technology in our goals and purposes. The FAME annual conference has earned a reputation for some of the best educational programming available to novice and experienced media specialists. FAME remains strong because of the talents of its volunteer board of directors and committeeswho lead the way in maintaining the viability of media in education. 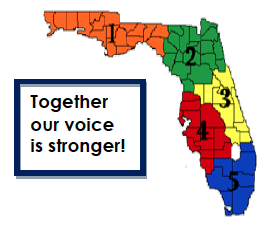 Fame members teach in one of five regions throughout Florida: five regions- one team! FAME believes in, and supports, the development of leaders within the association and within our schools. We encourage members to actively get involved in the association. The track for becoming a leader within FAME is to start at the committee level. Having served on a committee, a member is then eligible to both chair the committee and run for the Board of Directors for his or her region. Most committees are formed by the President in the fall after the annual conference. The Legislative Committee, SSYRA, SSYRA Jr., and FTR committees are placed in the spring by the President-Elect. Each committee varies in the amount of time required to serve and the time of year that is most intensive. Read the descriptions of the various committees on the committees homepage, then fill out the following form to state your interest. FAME is one of the top AASL affiliates in the nation, and we encourage all school librarians to actively be involved in its success.